A medium weight fishermans bib and brace packed full of features at an economical price. The Crew 640 includes heavy duty 630 gsm PVC with knee pads and triple layer protection over the knees. Ideal for fisherman, fish farming and commercial use. Introducing a medium weight fisherman’s wet weather bib overalls, based on our best selling crew 654. The Crew 640 is designed for those who don’t need a double PVC front, but value the protection provided by the knee pads and triple PVC over the knees. The leg is made from a single piece of 630 gsm PVC, eliminating the need for a side seam. This configuration reduces wear to the side area, ensuring the gear lasts longer. 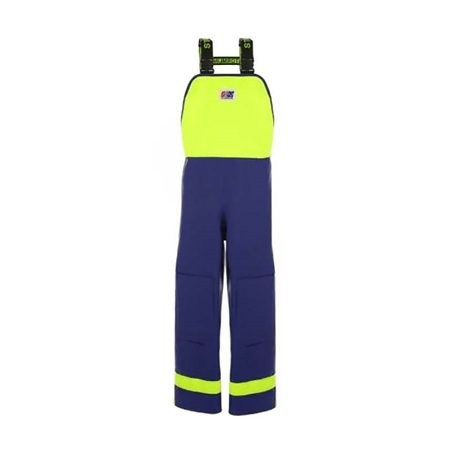 The elasticated waist with low back design ensures that this wet weather fisherman’s bib and brace is comfortable to wear in all conditions. Designed to be worn with the jackets.